AMDA has now dispatched three medical personnel to Atsumacho in Hokkaido. 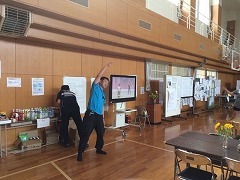 From 13th September, one AMDA nurse began providing health advice to the evacuees at Atsuma Central Elementary School. Working both day and night shifts, the nurse saw roughly ten people on the 15th. The main problems seen among the evacuees have been high blood pressure, fever, and minor wounds from when the earthquake hit. Those with common cold symptoms also seem to be on the rise. 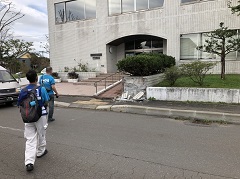 After six days of activities in Hokkaido following the earthquake that struck on 6th September, one of the two AMDA coordinators departed Hokkaido and safely returned to AMDA Headquarters in Okayama. However, the remaining coordinator was joined by the two nurses who were dispatched on 12th and 14th September. 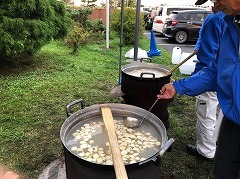 On the evening of 9th September, the two AMDA coordinators and AMDA Support Farmers Group* provided curry for the roughly 50 evacuees at Atsumacho Sports Center (an evacuation site in Atsumacho) and about 120 people living in the surrounding area. The AMDA Support Farmers Group* arrived by car to Sapporo City in the early hours of the morning of the 9th September after driving for more than a day. At the same time, the two AMDA coordinators entered Atsuma Town to prepare for the day’s meal provision. The two groups joined at around noon and, after consulting with a representative from the town hall, decided that they will provide meals for those evacuating at Atsuma Sports Center. Afterwards, they set up their area and began cooking 200 portions of curry. In response to the floods in India, AMDA put together a multi-national medical team to provide emergency medical relief to those affected in Kerala State. Further, from 3rd September, the AMDA team divided into two groups, one of which conducted emergency medical relief in neighbouring Karnataka State. In response to the earthquake that occurred in the early hours of the morning on 6 September in the central-east area of Japan’s northern-most island of Hokkaido, AMDA dispatched two coordinators to Hokkaido on 7 September. The coordinators will visit the evacuation sites and investigate the needs there. At 3:08am on 6 September, a magnitude 6.7 earthquake struck the central-east area of Japan’s northern-most island of Hokkaido. The epicentre was in the Iburi region, roughly 50km south of Sapporo, the regional capital. As of a report from the Hokkaido government office at 11:30am, two people are confirmed to have died and over 100 people injured. Also, according to local information, 2,950,000 buildings are without power. AMDA Thanksgiving Festival 2018 - All are welcome! With our heartfelt appreciation to all who have supported and cooperated with us over the years, AMDA will be holding ’AMDA Thanksgiving Festival 2018’ in the most beautiful village in Japan, Shinjo Village in Okayama Prefecture. 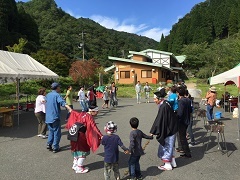 Activities will include harvesting organic rice grown on Notoro Farm, which is a part of the ‘AMDA Food Program’; eating food that is prepared in times of disasters (‘takidashi’); and entertainment such as dances and other performances - all while surrounded by beautiful nature. 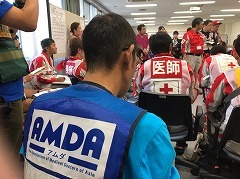 AMDA began its emergency response activities on 7th July in Soja City and on 11th July in Mabicho, Kurashiki City following the West Japan Torrential Rain disaster to provide emergency support to those affected. With the exception of its activities at Sono Community Center, which will continue until the end of the month, AMDA’s Emergency Response phase officially concluded on 15th August. The total number of dispatched personnel throughout this Emergency Response phase totalled 248 people, including those from all over Japan, and even from Mongolia. This figure also includes university student volunteers and medical personnel who helped provide medical and health support, acupuncture services, etc. at the evacuation centers and first-aid sites. More than one month has passed since the disaster began, and AMDA is now in the second month of its relief activities. After one month of conducting these activities, AMDA staff have seen some positive changes among the evacuees. For example, some have been able to find somewhere to live, either in new houses or with their families, and they now feel more at ease about the future. However, there are those who are still uncertain about the future, which is exacerbating stress levels. 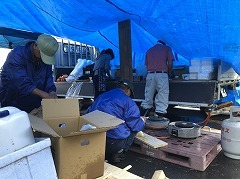 While the temperatures have been topping 35 degrees C every day in Okayama, AMDA is working hard to provide relief for the victims of the torrential rain disaster in Soja City and Mabicho in Okayama. Typhoon Jongdari is expected to strike Japan from the dawn of 29th July, with strong winds, landslides, floods and overflowing rivers feared to cause damage once again. On 28th July, AMDA continued its medical and health support activities for the evacuees at Okada Elementary School, Sunwork Soja, and at Mabi Community Center Sono Branch. 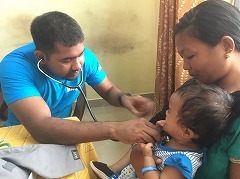 AMDA also continued to dispatch personnel to the Mobile Clinic at Mabi Memorial Hospital and prepared its transition from the Mobile Clinic to a prefabricated temporary clinic. On 9th July, it was decided that the evacuees in Soja City (including some who came from Mabi City – one of the worst-hit areas in the region) should be transferred to evacuation centers with air conditioning. 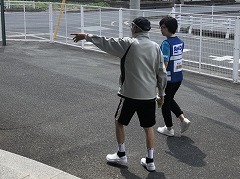 As there was no air conditioning at the Kibi Arena, where the AMDA medical team had previously been working, the Japanese summer heat was worsening evacuation conditions. Subsequently, the roughly 1000 evacuees at the Kibi Arena in Soja City were transferred across eight different evacuation sites in the area. 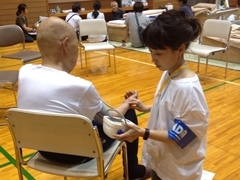 In the morning of 8th July, the AMDA Team, in cooperation with affiliated medical institutions and pharmacists, set up a first-aid station in the Kibi Arena, in Soja City (Okayama Prefecture), which is being used as an evacuation center. On 8th July, the medical team consisted of four doctors, six nurses, one physiotherapist, fourteen pharmacists, nine coordinators and five student volunteers (these figures include one nurse and three coordinators from AMDA Headquarters). A medical response team was sent to Soja City in Okayama Prefecture (not far from AMDA HQ) on 7th July in response to torrential downpours in West Japan. After visiting the Soja City Emergency Response Headquarters to gather information, the team went to the Kibi arena, one of the evacuation centers in Soja City. 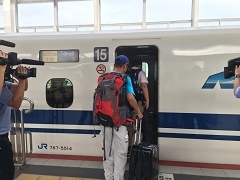 In response to the torrential down pours in western and central Japan since 6 July, AMDA has dispatched a relief team to Soja City in Okayama, not far from AMDA Headquarters. The heavy rain has affected wide areas of the country’s west and central regions where floods and landslides have been occurring. In some places, residents are still waiting to be rescued in stranded homes. At 07:58 on June 18th (Mon), a magnitude 6.1 earthquake hit northern Osaka in central Japan. In response to this, AMDA dispatched two coordinators from AMDA Headquarters in Okayama at 13:00. 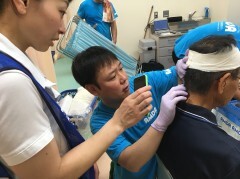 Surrounded by Japanese media, the coordinators said that, as it might be necessary to provide emergency medical relief, and there is a possibility of more damage caused by aftershocks, they will go to Osaka to grasp the scale of the situation. The two coordinators arrived in Osaka in the late afternoon and visited the disaster response headquarters in Takatsuki City and Ibaraki City. Both cities were hit hard by the earthquake. The team also visited Makami Community Center and Kawanishi Elementary school in Takatsuki City, which were both being used as evacuation shelters. AMDA Emergency Relief for Kumamoto Earthquake 6 On April 19th, the first team of AMDA's medical personnel (one doctor, two nurses and one coordinator) completed its mission in Mashiki-machi. 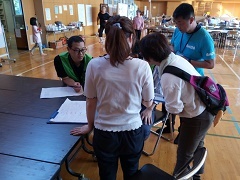 In collaboration with prefectural and local governments and other organizations, AMDA has been preparing emergency relief activity for the possible Nankai Trough Earthquake expected to hit areas on the Pacific coast in the very near future including well-known cities such as Tokyo and Osaka where many relief teams will more likely be gathered in case of the earthquake. 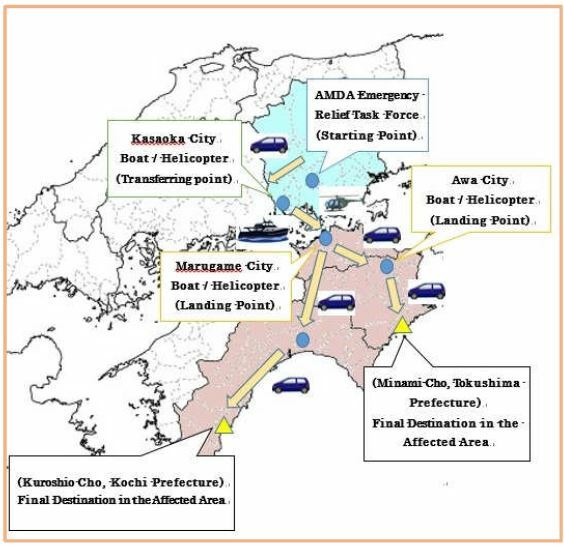 However, AMDA's focus is more on Shikoku region where not many relief teams know about and have access to. The Soja-AMDA joint team departed from Soja-city in Okayama prefecture on 12th of September 2015 and arrived on the same day at Nikko-city in Tochigi prefecture for East-Japan flood emergency relief. After a 2-days relief activities in Nikko-city, on the evening of 13th, the team moved to neighboring city of Kanuma and purchased necessary goods such as a sandbags, shovels, Deck brushes and head torches in preparation for the next day activity. 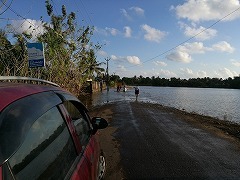 Though the continuous rain had eased by September 12th, some areas are still submerged under water. According to local newspapers, the death toll has reached to 7 in East Japan and 15 are still missing in Joso City. On 12th morning, AMDA/Soja joint emergency relief team departed from Soja City, Okayama prefecture and arrived in Nikko City in Tochigi Prefecture in the afternoon. 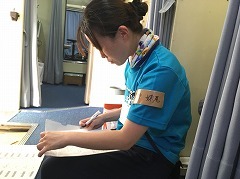 An AMDA Volunteer nurse from Saitama also joined the team in Utsunomiya and travel together to Nikko with the team. Iwate Prefecture (the town of Ohtsuchicho):Handing out nutritional supplements at the evacuation centers.Miyagi Pref. (the town of Minamisanriku-cho): *The team in Miyagi will be active until Apr. On Apr. 10th a number of volunteers gathered at a local temple in Okayama (home to AMDA) to sort out the stationery to be sent to the disaster victims in Ohstuchicho and Kamaishi City in Iwate Pref. 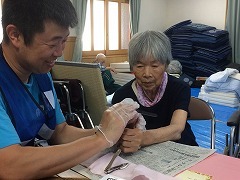 AMDA teams are ongoingly engaged in medical services both in Iwate and Miyagi Prefectures. This report is on the activities in Kamaishi City and the town of Ohtsuchicho in Iwate Pref. as of Mar. 22nd. 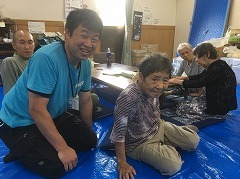 1) AMDA team in Sendai City, Miyagi Prefecture:AMDA team has been delivering mobile clinic services and relief goods to the nursing homes and schools (evacuation shelters) in Aoba and Miyagino Wards. AMDA dispatched a medical relief team on the next day of the earthquake. Having local Osada Municipal Office as its relief hub, AMDA had set a temporal clinic and conducted mobile clinic services.